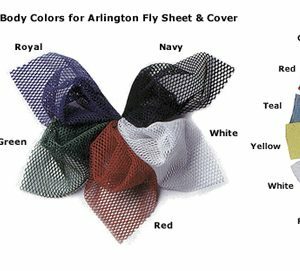 The stylish and traditional way to keep your horse comfortable, the Arlington Fly Cover protects against flies and annoying insects. Made of 100% polyester mesh. Fully taped and bound with brow band, tie strings and tail piece. Machine wash on gentle cycle with cold water, using cold water detergent. Line dry only. Do not dry clean. Need Help? Download a PDF of our size chart. 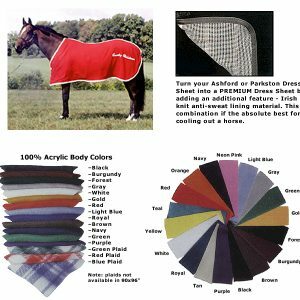 The stylish and traditional way to keep your horse comfortable, the Arlington Fly Sheet protects against flies and annoying insects. Made of 100% polyester mesh. With two straight surcingles and reinforced inner panel. One buckle open front. Standard neck only. Made of 100 percent acrylic, coolers are essential for the equine athlete working fall through spring. They speed drying of sweaty or just-bathed horses, while keeping the horse free from chill. Plaids not available in 90″x”96″. Washing Instructions: Machine was on gentle cycle with cold water, using cold water detergent. Line dry only. Do not dry clean. Download and view a PDF of our Lettering/Monogram styles. Please call 1-800-544-6773 to add this feature. 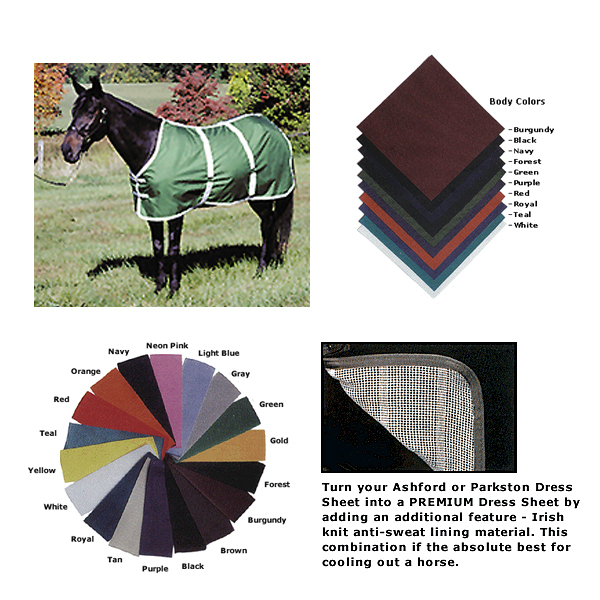 Also known as paddock blankets, these dress sheets are made of excellent quality materials in 100 percent acrylic. Available with standard neck only. Made with a reinforced open front, with one buckle and strap closure, hidden surcingle and tail piece. You may add the Irish knit anti-sweat lining. Plaids not available in 90″x96″. Washing Instructions: Machine wash on gentle cycle with cold water, using cold water detergent. Line dry only. Do not dry clean. 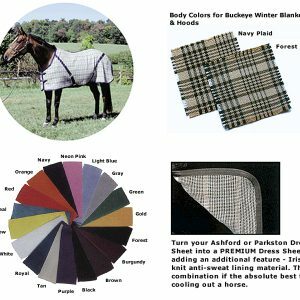 This traditional sheet is offered in navy plaid or forest green plaid and has been the favorite of many horsemen for most of this century. 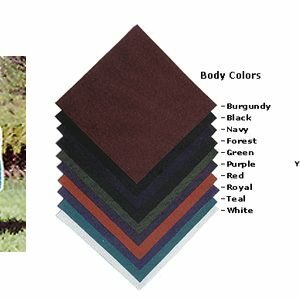 We use the highest quality machine washable lightweight acrylic fabric that will not shrink or fade. With bias surcingles and contoured rump. Available in open front (2 buckle) or closed front styles. Standard neck cut and matching trim is the norm (specify any other neck cuts or trim colors). Washing Instructions: Machine wash on gentle cycle with cold water, using cold water detergent. Line dry only. Do no dry clean. View our neck cut styles by downloading this PDF. Made of water-repellent (not waterproof) polyurethane coated 1000 Denier Nylon Cordura, the Bradford Rain Cover is fully taped and bound with brow band, tie strings and tail piece. Size is 90″x90″. Made to take whatever abuse your horse can hand out, the Bradford Rain Sheet is water repellent (not waterproof), which is useful in cold, wet climates. 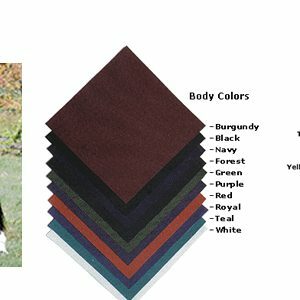 Made of machine washable 1000 Denier Nylon Cordura with 1 1/4 oz. urethane coating. It can also be placed over the top of your expensive winter blankets to keep them clean. In your choice of body and trim colors. With 2 straight outside surcingles and a contour rump. Available in open front (2 buckle) or closed front styles. Matching hood available. Warms the area of the shoulder muscles. Made of 1000 Denier Nylon Cordura material lined with 16 oz. Yukon Fleece. Closed front with one surcingle. Made with the traditional multi-plaid material that has been so popular for more than 75 years. 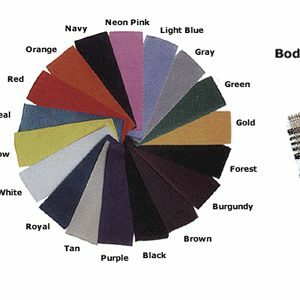 We use only the finest quality, machine washable, triple weave acrylic that will not shrink or fade. 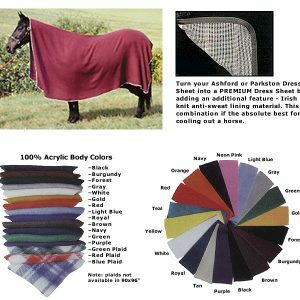 The triple weave keeps your horse warm through the night. Choose from body colors of navy plaid or forest green plaid. With bias surcingles and contoured rump. Available in open front (2 buckle) or closed front styles. Standard neck cut and matching trim is the norm (specify any other neck cuts or trim colors). Matching hood available.